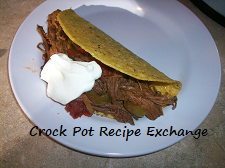 Place the onions and peppers in the bottom of a 5 – 6 quart crock pot. Now add the cider and soy sauce. Sprinkle the ground ginger and salt. Add the brown sugar and stir to incorporate. Place the roast on top of the mixture. Spoon the liquid mixture over the roast to cover it. Cook on low for 6 – 8 hours or high for 3 – 4 hours. When roast is done, remove it and place it on a serving platter to rest. In a small bowl add the corn starch and water. Stir until it has no more lumps and is ver well mixed. Add the mixture to the crock pot and stir to incorporate. This will thicken and make a gravy like consistency. Slice the roast and and serve over rice or mashed potatoes with the gravy from the crock pot.